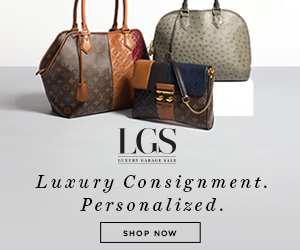 Day Trips From Paris: The Champagne Region | Gina Miller's Blog - A working mom's blog about fitness, travel, handbags & beauty. If you're in Paris and have even the slightest interest in wine, making a day trip to Champagne should be on your list of "Must-Dos". The terrain is gorgeous, the wine and food are magnificent and it's a relatively easy region to access....once you figure out to get there. The first time we tried to visit Champagne was in June 2013. I consulted a number of my friends who work in the wine industry and represent the likes of Dom Perignon, Moët & Chandon and Ruinart in the states for help. They told me it would be impossible to get into of the Champagne houses for a tasting. Taking that into account, we didn't make any advance reservations. We ended up visiting not one but two houses without any advance reservations on that trip but it cost us. A lot. 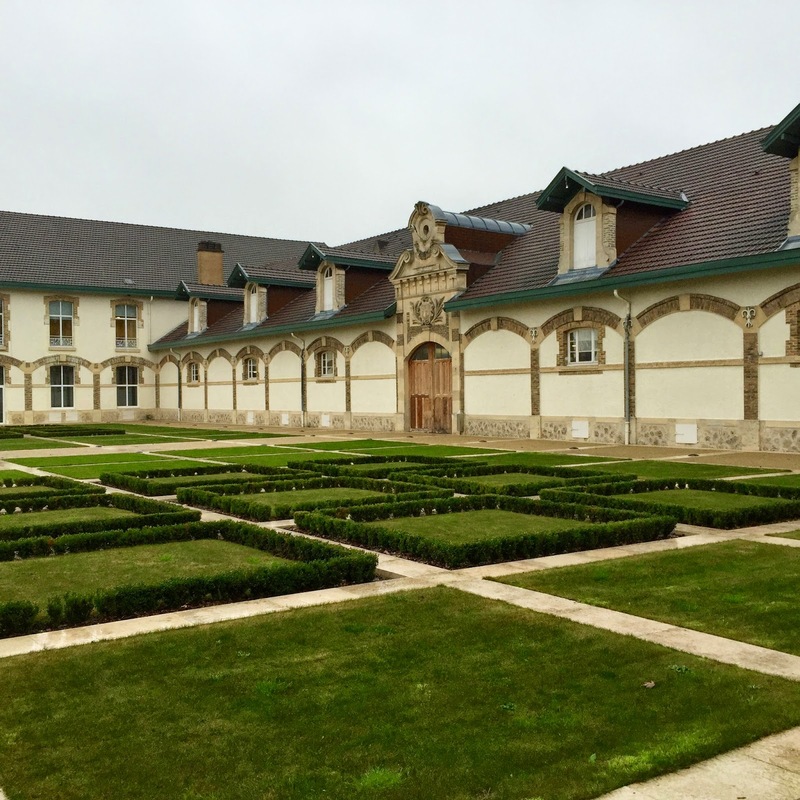 On Thanksgiving 2014, we visited Champagne again having learned our lessons: we made tasting reservations in advance for only one house and took the train to get there. It was a much more enjoyable experience and affordable to boot. There are 320 houses Champagne houses in the region. Gaining access to these houses is, for the most part, different from typical tasting experiences in the states. In Napa, for example, you can pop into most wineries without a reservation or make a reservation the day of your desired tasting. (Click HERE to learn about visiting Napa Valley with kids). In Champagne, most tours are by appointment only and it is suggested that you make reservations a few weeks in advance. This can be done easily online at the Champagne house's website or you could work with a tour company. When we went in 2013, we hired a driver to take my husband, my daughter and me from our rental apartment in Paris to Moët et Chandon in Epernay and then on to Tattinger in Reims. This cost us a fortune. Like $1,000 for the day. Jaw. Dropped. Granted our driver was able to finagle all three of us into Moët et Chandon and Tattinger without a reservation but the cost was ridiculous. (btw...and I almost divorced my husband over this). In 2014, there was no way I was forking over that kind of cash for a private car. 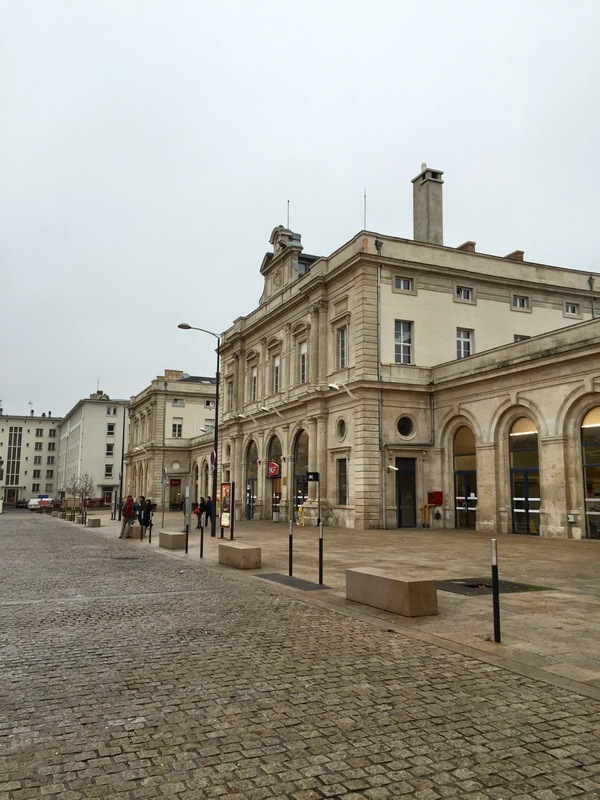 We booked two TGV tickets (our 2-year old daughter traveled for free) on Thanksgiving Day from Paris' Gare d'Est station to Reims, the older station in the heart of the city, which takes about 45 minutes. This cost about $92 per ticket. You can also take the train to the Champagne-Ardenne station in Bezannes. We met a couple from Houston on our train who bought a tasting tour which included train tickets, transfers to the chateaux and entry fees. They had priced out the package and determined it was comparable to piecing everything together on their own. Having gone the private car route and the train route, I can wholeheartedly recommend using the train. Once you exit the main entrance at train station in Reims, there is a line of cabs waiting to take you anywhere. Beyond that, cabs are easy to get throughout Reims. Any restaurant or Champagne house will call one for you. For our visits to both Moët et Chandon and Tattinger in 2013, we did not have reservations. Our driver, Amadeus, was able to get us into a group tour at each house. These tours were informative and thorough but they were packed with about 20 people in each group. For our visit in 2014, we made reservation at just one house: Ruinart, the oldest house in Champagne producing the bubbly since 1729. They were quite specific as to when we could visit and at what time. We were invited to enjoy either a 10am or 2pm tasting. When we arrived in Champagne, it was a cold, rainy, French day. Our cab took us straight to Ruinart which got us there around 9:30am. The guard at the gate would not let us in, even simply to sit and wait for our appointment. This annoyed the heck out of me. I pleaded with him in my bad French to accommodate my daughter, husband and me and let us just stand in a covered area out of the rain. He wouldn't budge. So we paid the cab driver to drive us around the city. Once we did get into Ruinart at around 9:50, we were greeted by a lovely young woman named Kelly. There were only two other people on our tour, a couple from Brazil. This made for an intimate, educational and overall much better experience. Any chateau in Champagne is impressive but Ruinart was stunning. The house had recently been renovated but the "sprucing up" resulted in timelessly elegant French style that can withstand another 100 years. There are 38,340 bottles of Ruinart aging here! We learned about the family history of Ruinart (started by Nicolas Ruinart), the reason behind its bottle shape (it results in a better product) and why Ruinart is in a class by itself (the Blanc de Blanc is made exclusively of chardonnay grapes, for one). 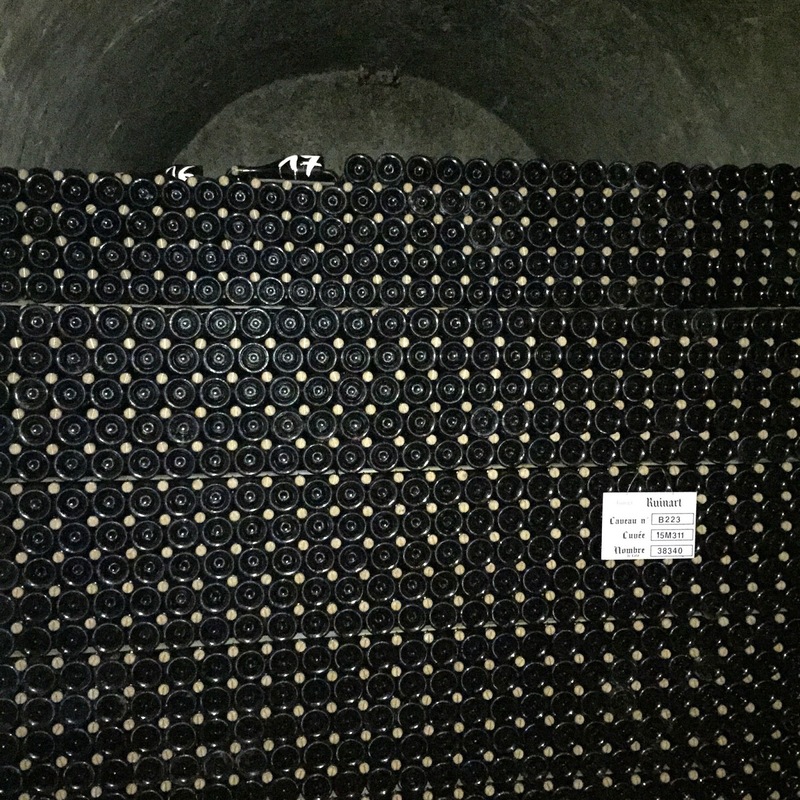 Our tour took us deep into the caves beneath the beautiful Ruinart gardens where we saw a glimpse of Champagne's heritage. 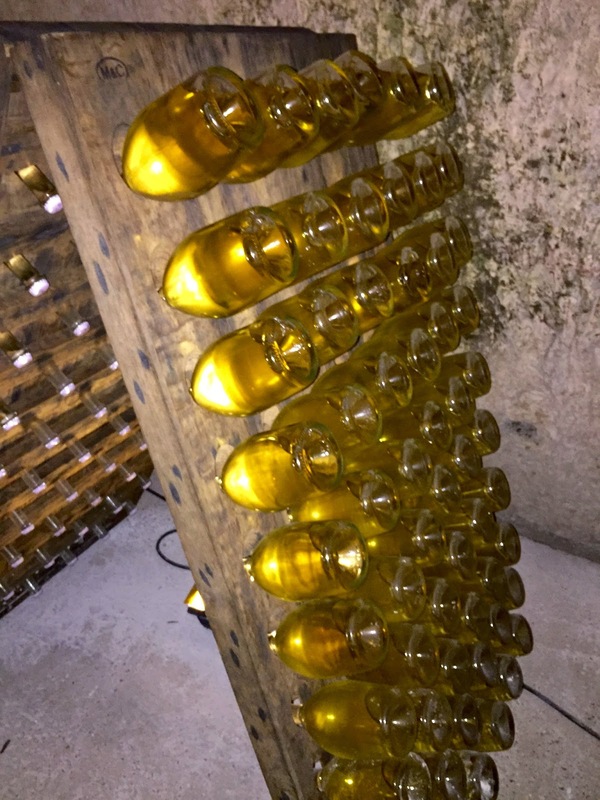 Ruinart bottles are aged on decades old racks, where riddlers twist them 1/8th of a turn daily. Kelly claimed Ruinart's two riddlers can manage 50,000 bottles a day! The visit concluded with a tasting of our choice of two of four wines offered: Blanc de Blanc, Dom Ruinart, Dom Ruinart Rosé and R de Ruinart. I went with the R de Ruinart and Dom Ruinart. On our first visit, we had lunch on the patio at the popular Brasserie Flo centrally located on the main promenade. It's one of those places you can't miss. For our second visit, we had a stunning lunch at Au Petite Comptoir. I couldn't tell you how to get there to save my life. Kelly at Ruinart drew directions for us but it's located on one of those typically French side streets that disappear the moment you blink. When I stopped at a police station to ask for directions, the station chief smiled and told me I was in for a phenomenal treat. God, I love how the French flirt! I simply ordered the specials. My daughter was asleep in my lap while my husband left his phone at Ruinart and had to run back there to grab it. While I enjoyed my meal alone, alas, there are no pictures to capture the experience as my phone's battery was dead. #1stWorldPains. EVERYONE recommends Les Crayeres, the 3-star Michelin restaurant located in the Relais et Chateaux property, Chateau Les Crayeres. We couldn't get in there for lunch. There are a number of decent places to eat on the main promenade in Reims, Les Basses Promenades. If You're On The Fence About Visiting Champagne, Don't Be. Go! France is full of stunning, historic and magical places. Champagne's beauty is in a class by itself. If you are in Paris you should, without question, try to visit this region. Find a producer that interests you and start from there. I have always loved Moët et Chandon and Ruinart. I would love to visit Krug and Veuve Cliquot on my next trip. Email the maison about reservations a few weeks prior to your trip. You will likely have pay at the time of booking. Do some Googling about your trip to get a general sense of where you will be going. The train and cab route was a breeze but it might not be for you. Tentatively schedule your day but bring an open mind. You never know where the day may take you. Most maisons will accommodate children. Check, though, to ensure they do. At both Moët et Chandon and Ruinart they provided juice and snacks for our daughter. A definitive guide to getting to Champagne. Comité Champagne trade association - a US-based organization that has tons of useful information on Champagne. TGV - the train we used to get to Champagne. Via Champagne Ardenne - a tour company that arranges visit to Champagne.